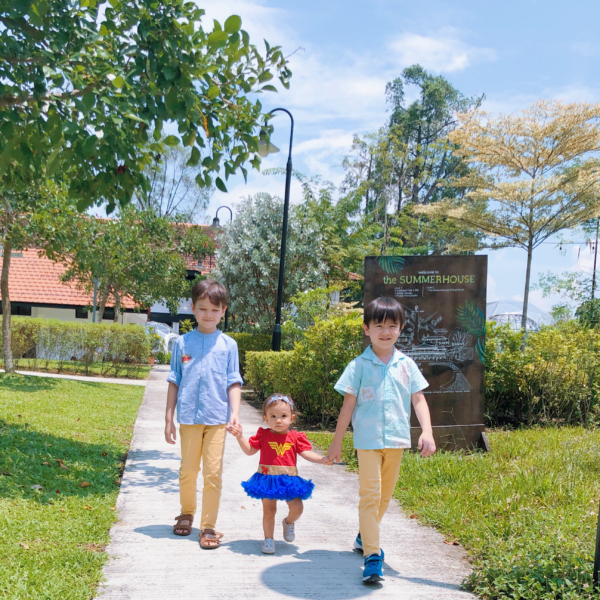 FOOD REVIEW: THE SUMMERHOUSE DOES FAMILY BRUNCH | Beverly's Net: family. food. fashion. 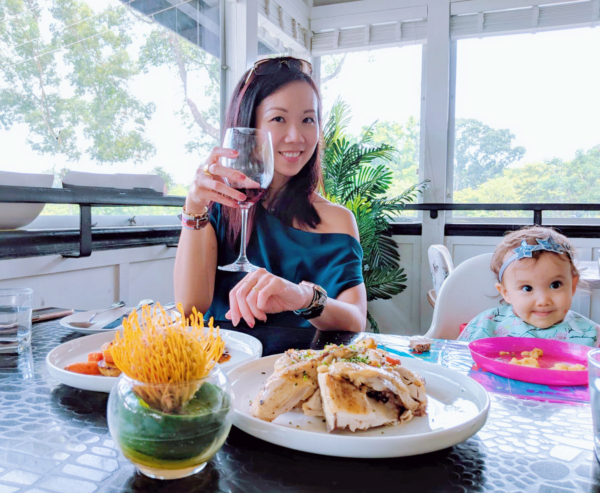 FOOD REVIEW: THE SUMMERHOUSE DOES FAMILY BRUNCH – Beverly's Net: family. food. fashion. We took the drive up to The Summerhouse on a gorgeous, sunny day. 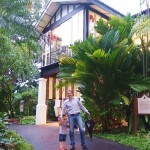 Their picturesque garden surroundings (ohhh all that open space!) made for some really lovely photos, so I can see why The Summerhouse is often used as a wedding or function venue. 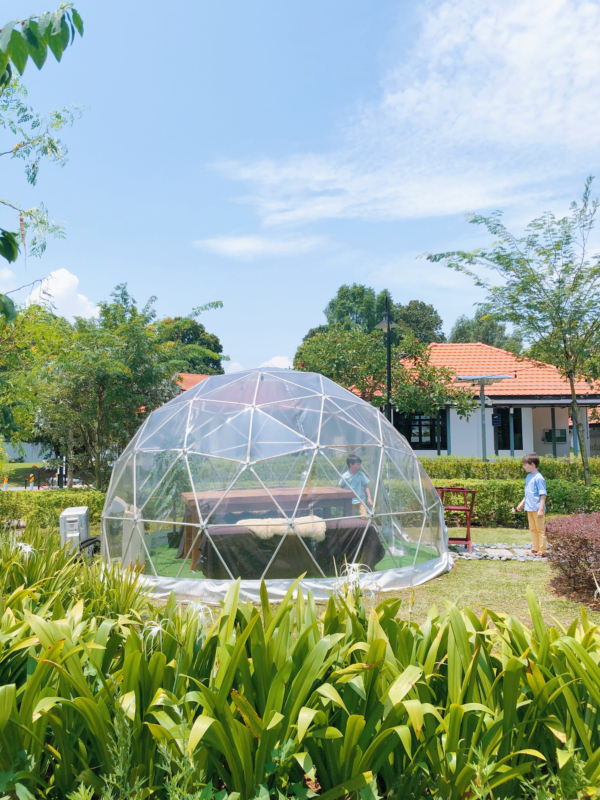 The star(s) of the show.. three big igloo-like dining domes, that are fully air-conditioned and each have their own private sound system. Wouldn’t this be lovely to propose in, when you’re under the stars but in cool air-conditioned comfort?! 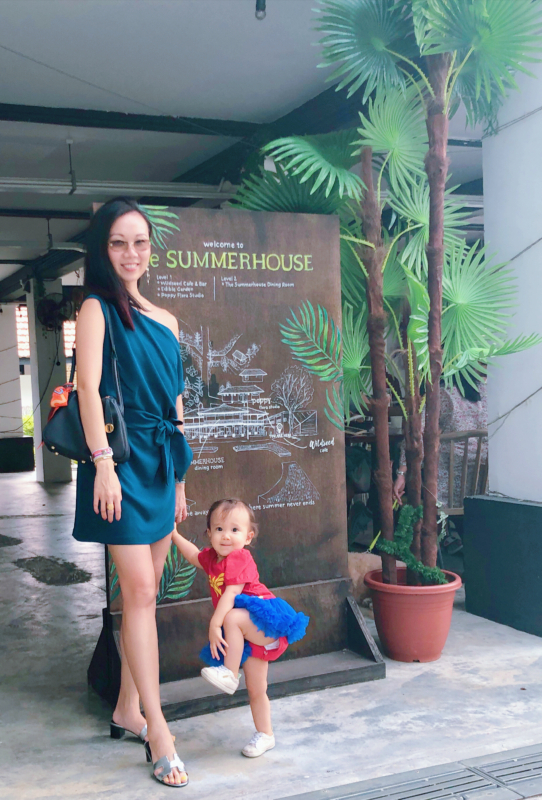 Come weekends, The Summerhouse transforms into a really family-friendly spot, especially for those with little kids. 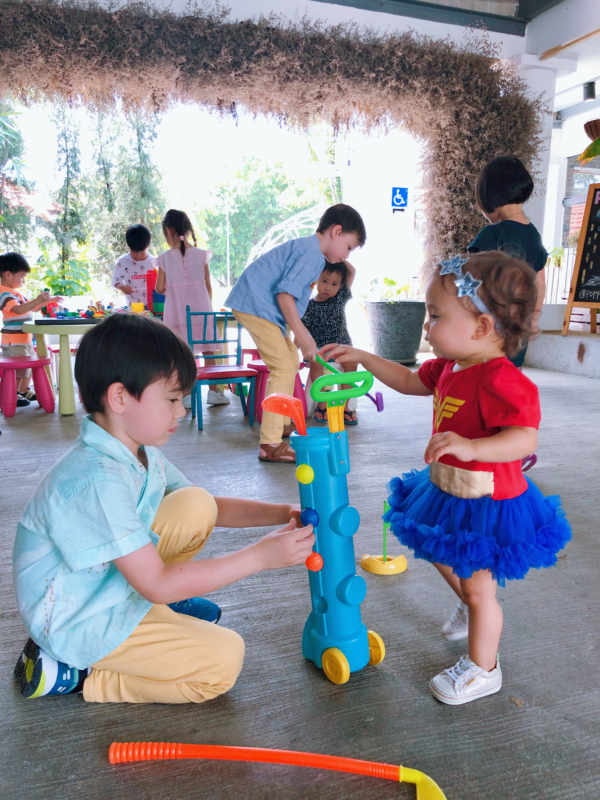 There are tables of building blocks and toys everywhere on the ground floor of the Colonial-style bungalow – my kids were delighted! I absolutely love dining places that have a dedicated children’s area (it just shows that they care, y’know? ), or even a simple colouring sheet and markers will suffice. 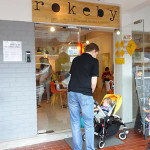 I think parents with young kids will be so grateful if most establishments did this. 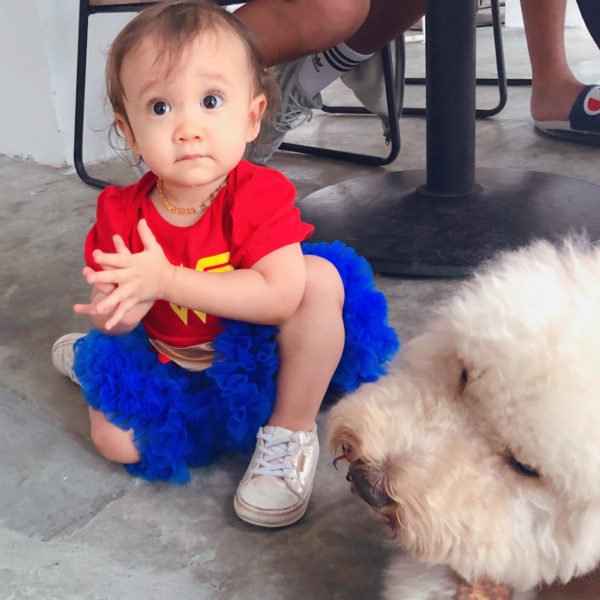 Chloe was particularly fascinated with the doggies.. as diners can bring their dogs, as long as they’re seated outside. 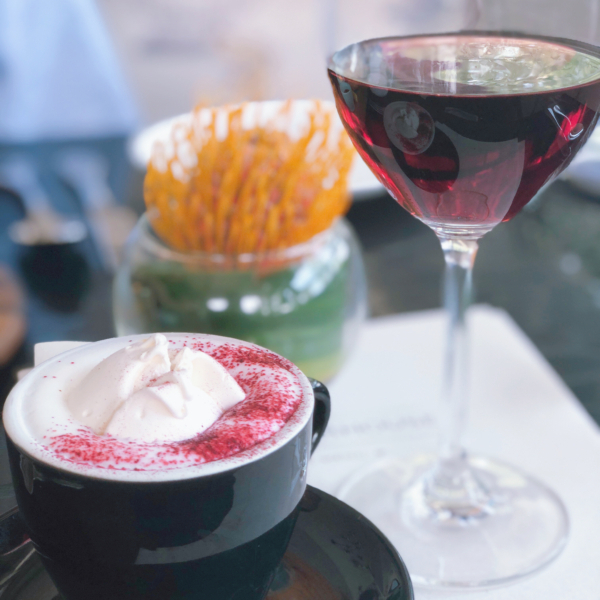 I kicked off with a glass of Casablanca Valley Chile Pinot Noir ($12), and I also couldn’t resist trying out their Signature Wildflower Latte ($6.50) – which is a beautifully presented latte with a big fluffy meringue floating on top. It’s pretty gorgeous! 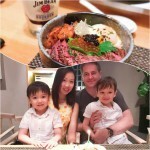 Their Kids Menu comes presented like a proper adult meal.. which the boys were delighted with. This Fish with Curly Fries came with 3 chunks of beer battered fish, and a big helping of curly fries! 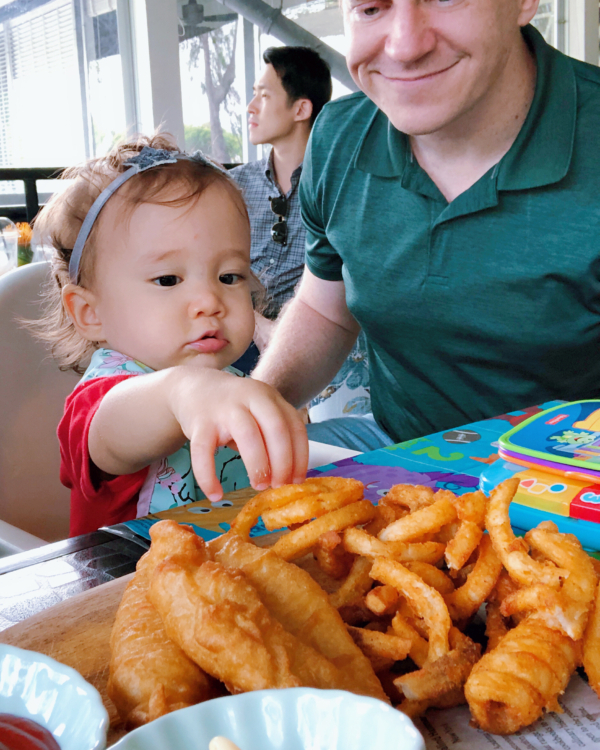 The most excited person about this was Chloe, who pretty much destroyed those fries. 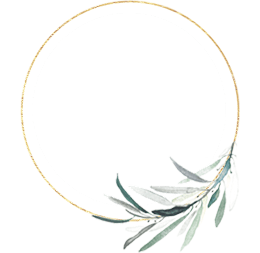 The Summerhouse offers farm-to-table cuisine, which means you get the freshest produce and local ingredients. 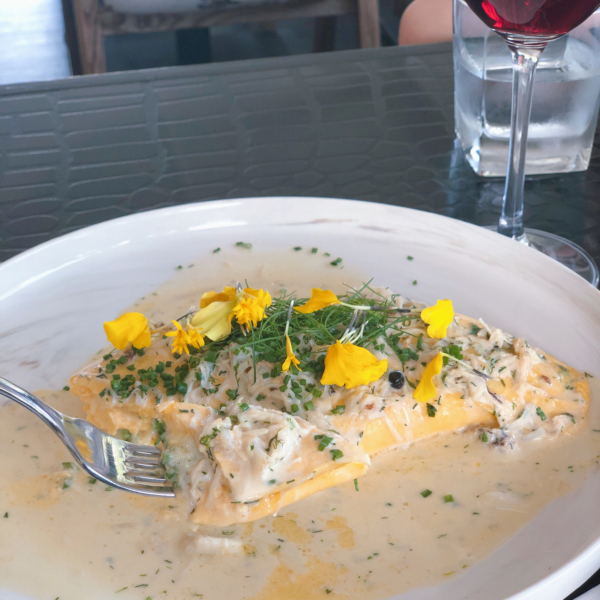 This Mud Crab Omelette ($24) was one of the prettiest dishes I’ve seen in awhile, and my kids loved it too! The sweet hand-picked fresh mud crab was scattered densely over the creamy omelette, and drizzled with a warm Beurre noisette butter. It’s delicious. 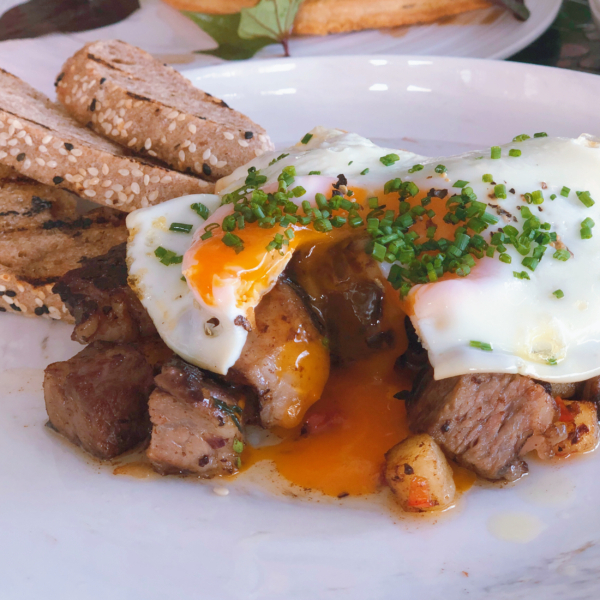 The meat lover in me really enjoyed the Prime Short Rib Hash ($28), especially as it was brunch-ified with a sunny side up egg on top. The short rib chunks were really tender and not at all stringy, and I liked them much more with the cubed fried potatoes than the rye bread. 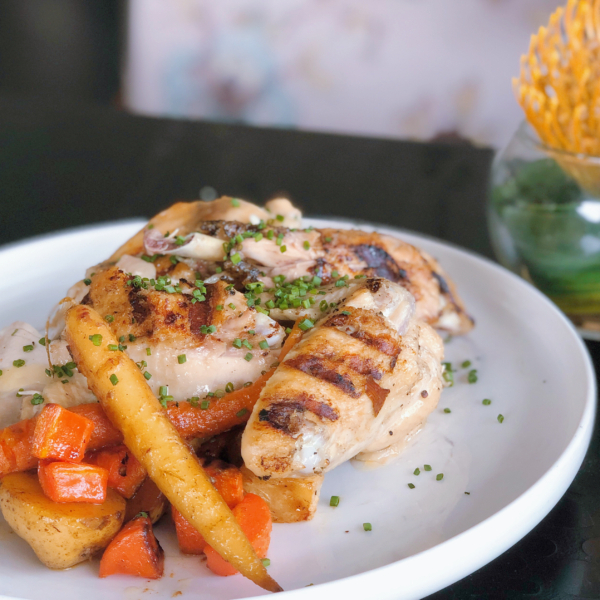 If you’re after a biiiig chunk of protein, check out their Free Range French Poulet ($28). It was probably the least exciting dish for me, though the chicken was tender and flavourful. My kids loved the roast vegetables, though! This beautiful chunk of Mayuru Full Blood Wagyu MB9 + Flank was OUT OF THIS WORLD. It’s “full blood”, meaning the cattle hasn’t been cross-bred. 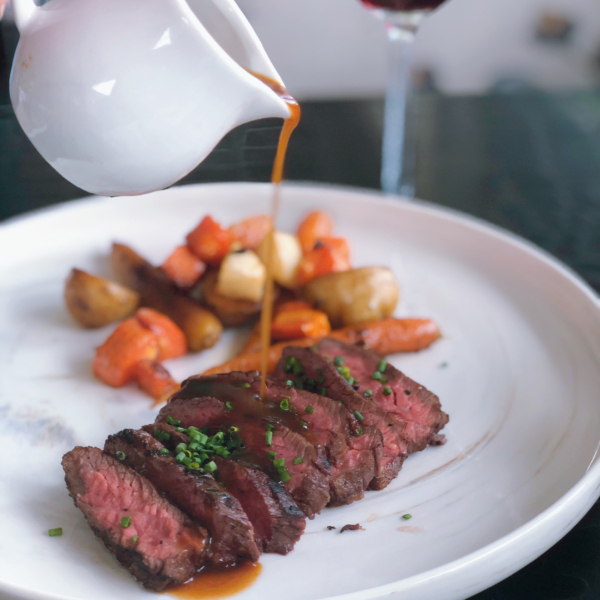 It’s creamy and tender, and heavenly for beef lovers! 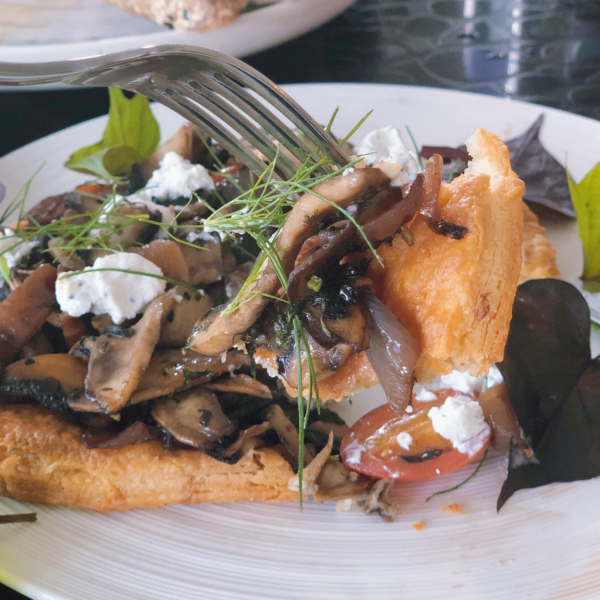 I didn’t expect to like the Open Portobello Mushroom Tart ($18) as much as I did. But the buttery pastry totally sold me, as did the generous tumble of roasted portobello mushrooms. It was light yet tasty, and the tomato salad (with Cameron Highland tomatoes) was really refreshing. Us girls, enjoying our leisurely long brunch. Gotta love the sun-filled room! 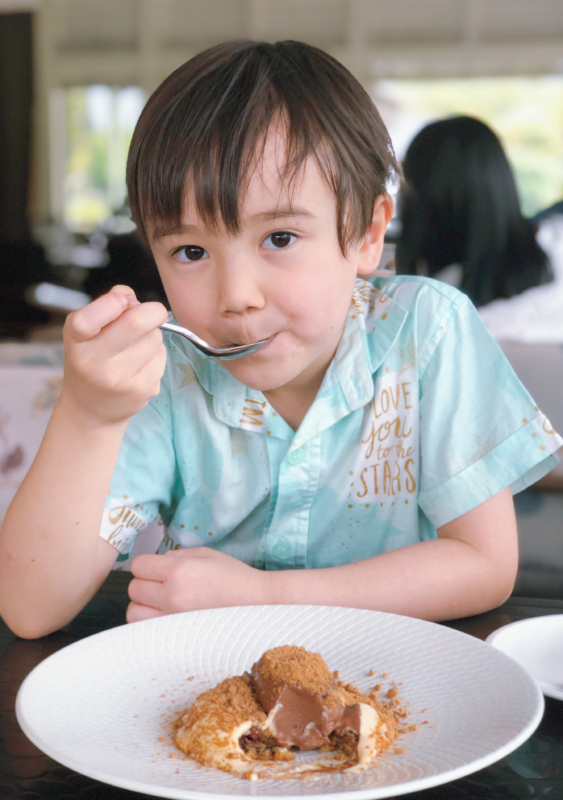 Carter, my chocoholic, went bananas over their Balinese Chocolate Ice Cream ($12) and polished off this dish by himself. If you’re into rich chocolate and pure indulgence, this is a winner. The chocolate ice cream is paired with a creamy vanilla custard, and dusted with hazelnut cookie crumbs. Yum! The very simply titled Rockmelon ($14) is quite the beauty! 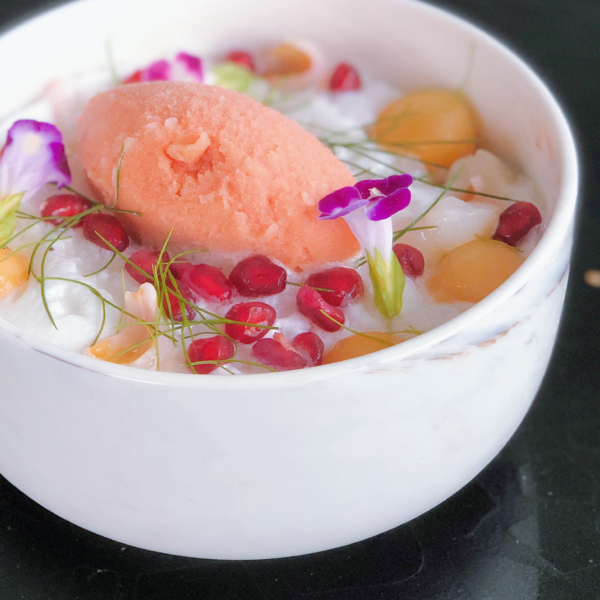 The heavy bowl comes filled with juicy summer fruits (rockmelon and lychee). There’s sweet mango pudding hidden at the bottom, with a fluffy lemon ‘cloud’ on top to add a tinge of tartness. The whole dessert is so refreshing, as it’s served chilled. So good for Singapore’s heat! Awesome lighting for OOTD pics.. oh that natural light! The little miss hasn’t quite gotten the idea on how to strike a pose yet.. this was the best we got!